We’re baaaaaaaack! Social Media Weekend returns June 2015! Early-bird tix are just $99! We will be announcing full details soon. Many thanks to all of you who nudged us along the way, including @EmanHAly from Chicago! 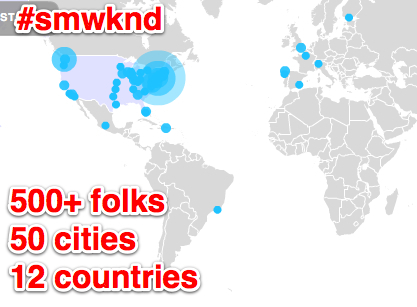 In 2011, more than 250 people from around the country attended various parts of the weekend; in 2012, more than 500 people joined us from 12 countries. THIS YEAR, our THIRD annual Social Media Weekend will once again be a fun, interactive, multi-day learning experience filled with new-fangled tools and services. Get ready, #smwknd will also be sprinkled with lots of old-fashioned networking. ATTENDEES: Social Media Weekend 2012 @ColumbiaJourn *via @sree. In addition to panels and workshops, there will be a continuous group of Social Media Doctors offering social-media makeovers, tips and feedback in one-on-one and small-group sessions. Whether you’re seeking a nuanced assessment of your social media presence or just need someone to explain the basics, they’re here to help. There will also be professional photographers on hand to take headshots that you can use as your profile photos. Worth the price of admission alone! TICKETS ARE STILL AVAILABLE FOR SUNDAY, FEB. 17. Don’t get left out! AMONG OUR 50+ SPEAKERS: We have confirmed @EmilyBell, Director of Columbia’s Tow Center for Digital Journalism and @MarkLittleNews, founder of Storyful, @MarkSLuckie , Twitter’s Creative Content Manager: Journalism & News AND Vadim Lavrusik from Facebook‘s journalism team – among our keynotes. See our EXCITING, updated SCHEDULE. CHECK OUT what everyone is tweeting about! Follow @columbiajourn for the latest updates and our hashtag: #smwknd.